I saw this swami once. He told me that my life would shape the world. I hadn't thought too much about that flattering moment until today. I met a very interesting young woman this evening at dinner. My wife and I decided to try a new restaurant which recently opened and, much to my wife's delight, our server was someone she knew. It turns out that my wife and our waitress are both currently enrolled in the same Improv class. At this point, you're probably thinking that I was either entertained or annoyed by the spontaneous comedy brought forth by these two women. The truth of the matter is that I found the conversation engaging and refreshing. Rather than attempt dinner theater, our server offered intelligent conversation and witty banter. Each drink refill, course delivery or clean up brought more opportunities to explore the nature of idealism, social conventions and the never ending quest for purpose. While our waitress provided thoughtful points to ponder, it was in reaching for answers to her questions that I found myself remembering aspects of myself which I'd allowed to collect a bit of dust. Seeing this young woman so full of belief in her ability to change the world reminded me that I once felt the same way about my own contributions to society. Oddly enough, I was confiding to my wife on the drive to the restaurant that I was feeling rather ineffectual lately and wasn't happy about it. I was feeling as though the whole, "your life will shape the world" thing was one of those cheesy sentiments—the one where 'shaping the world' means that some off-handed comment or wrong turn changes the life of the person who eventually does the actual world shaping. Almost as if in answer to this feeling, I end up in a conversation where a young mind eagerly stares at the limitless horizon of her life. I have to admit it was inspiring. The concept that we all have the power to change the world within us is something I've recently filed under high-school platitudes. Perhaps it is time to dust off my idealism and forge forth into the world armed with creative spirit and dogged adolescent determination. Maybe, the answer to changing the world can be found right here in this very blog? Ok, maybe not. The point is that after this simple conversation it dawned on me that no matter how routine I've allowed my life to become, no matter how choreographed my emotional and intellectual responses might be, there is always room for big ideas and bigger actions. What legacy will I leave behind? So far I can proudly point to my two amazing children and my supportive wife and this blog. One day, perhaps, you'll be able to say, "You've seen the movie and read the book but I read the blog that started it all!" Perhaps I'm destined for the greatness I always envisioned growing up. Maybe I'm changing the world as I type these very words! Maybe I am somebody able to instigate paradigm shifts. Maybe great power truly lies within me! Maybe, just maybe . . . I saw this swami once. He told me that my life would shape the world to come. Maybe I'm the real deal. 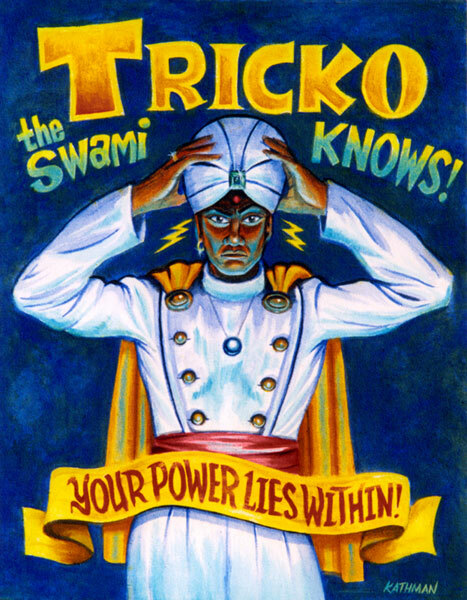 Either that or he might have just have been called "Tricko" for a reason. I suppose the world and future history will ultimately tell the tale. 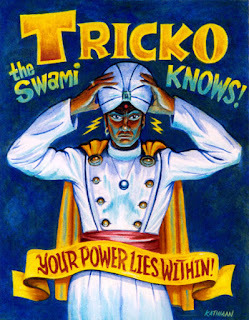 'Till then, I'm going try to live up to the swami's expectations. We all create the universe, even if we don't realize it.